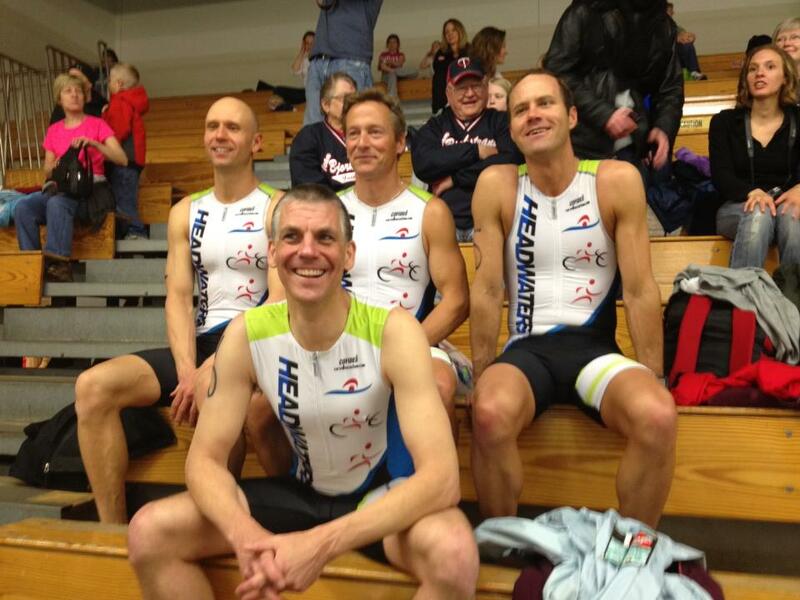 Headwaters had a great presence claiming four of the top ten spots. Excellent race David, Dan and Matt. Pre Race: Left the hotel at 7am, Claimed a spot in transition, Picked up registration materials, got body marked and returned to the hotel by 7:30 for a nice nap. Returned to the race venue at 9:00, setup transition and griped about the race conditions with the other racers. All shared their strategies for preparing for the cold in T1. Swim: We got into the water about 11:00 as usual. The temps this year weren’t that much better at 11:00 than the temps at 9:00. I was put in a lane where I knew I would be the fastest swimmer. I really like drafting as I can easily drop 30 seconds from my time drafting the right swimmer, but that was not to be this year. None the less, I still had a great swim time for me, especially considering my almost one day per week swim training schedule. My feet hit the deck at the 9:37 mark which was about 30 seconds faster than I expected. The official swim time included a minute indoors toweling off and trying to wriggle into my long sleeve lycra top and team jersey. T1: I exited the pool still trying to get into that long sleeve top and jersey. Getting into anything wet is quite a task, but I didn’t want to be sleeveless. With my minute in the pool area added to the transition time, my T1 was nearly 3 minutes long. I shouldn’t complain! I needed that shirt and would have been too cold to be an effective biker without it. Forty two seconds separated me from a 4th place finish and while I can’t completely attribute all 0:42 to T1, a smooth donning of that shirt would have made a big difference. Bike: The temp was right around 36 degrees. I did not put on any leggings and went in my shorts. There was a light rain and the road surface was very wet. Road spray ensured that we would be wet the entire ride regardless of whether it was raining or not. One rider dumped it not too far out of transition which made me consider an extra bit of caution. I had gloves slipped on the ends of my aero bars. This worked out well as I could ride and shift while they were there. I was able to slip my feet into the shoes as normal and use my bare hands to do it. I got the first glove on by the time I reached HWY 29 and the second one shortly thereafter. I took it pretty easy on the bike, knowing that it hasn’t been my strong suit. I noticed a stinging sensation in my legs from the cold, but it went away after a while. It became very apparent that the bike was going to be the limiting factor for most riders as I began passing several. It appeared to me that I was going to finish better than expected if I could put together a decent run. A check of the results shows that my bike time was fourth best overall. I felt quite good at the end of the bike and was ready for a decent run. T2: Went as normal and expected. I apparently didn’t strap my shoe tight enough as it felt loose on the run. Run: The run went as expected as well. I was shooting for a sub 6:50 and I hit a 6:48. Maybe I could have shaved a few more seconds off. The stats show that I passed 7 and was passed by 2. That jives with what I can remember. 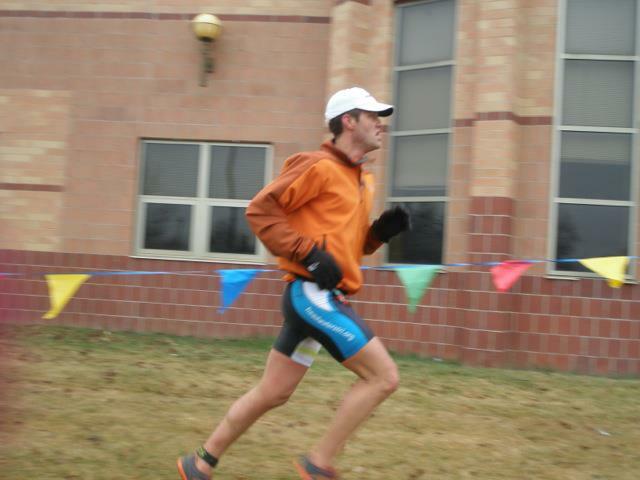 Post Race: The warm shower was somewhat painful as certain areas of the body warmed and regained feeling. Thoughts: Overall it wasn’t as awful as everyone says. Make no mistake, it was cold, wet and nasty. But as David Lewis aptly stated, “It’s only an hour.” We will be telling stories about this race as long as we hang with other racers. Pre-Race: Woke up at 4:00 am as normal for any other day of the week. Got a message from David Lewis asking about the weather while I was eating my granola with almond milk. Being the optimist I said that it would be cool but fine by race time… We will see how that turns out. Left the house at 5:15 with an empty tank of gas and rain drops on the windshield. Got to Alexandria at 7:00am, claimed a spot in transition right near an upright and on the opposite side of the rack as the person next to me. Judging by the bike, I figured they wouldn’t be there when I got out to T1, perfect situation. Ate a peanut butter and honey sandwich around 9:30 and a banana at 9:00am. Sat around, wandered the school and transition area without setting much up. Watched a few waves of swimmer before taking a warm-up run a little before 10:00am. The run felt good, wet, but the legs were not stiff from the morning of sitting. I had a vanilla bean gu when wave 7 started, which gave it 12 minutes to settle before our start. Swim: Based on my time I got put in a lane with two people I had never swum with before. We discussed average /100 paces and I thought they were a little optimistic, I let them lead off and figured I would evaluate after every 50. It was easy to keep an eye on the pace as we started at 00 on the wall pace clock. After 150 yards the lead guy pulled off, the guy second in line took over and pulled for another 150 yard before clinging to the wall at the turn. I lead the rest of the way and hoped out of the pool at just about 9:30 (1:35/100 pace). Spent a little time drying off and not crashing into David Bjorklund as we lunged for our towels. T1: Got to the transition area, put on a jacket, which was a little bigger than I would have liked, grabbed the helmet and got that buckled, and put on gloves that I had on the aero bars. In hindsight I should have left them on the bars until I got up to speed. Ran up the chute, turned the corner and hopped on the bike. 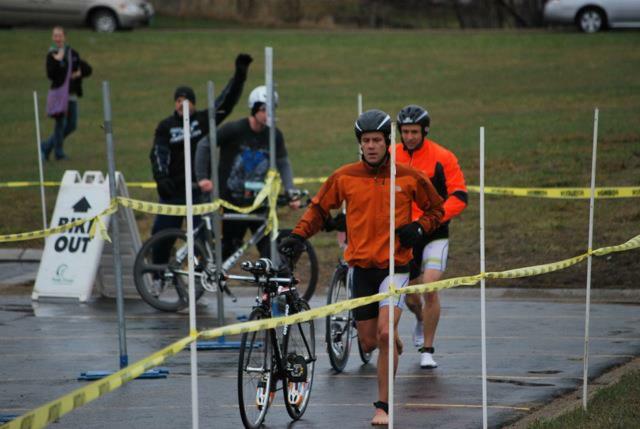 Bike: The first half-mile was spent attempting to gracefully get shoes on with gloved fingers. David Lewis passed shortly after this followed by Matthew Dickenson, and a few others. I felt the burn in the quads so I figured that I was pushing my pace well enough. As a few more people passed me I realized I needed to evaluate my pacing on the bike. I pedaled throughout the entire bike ride and did not let up to coast the down hills. This was also the first ride under aggression on my new saddle so I was quite perfect on my position but overall I did learn that the new saddle was an improvement in comfort. The last 5 miles on the bike I paced myself off of David Bjorklund and Matthew Dickenson and hoped I could chase a few people down on the run. The biggest complaint was the wind and the pain it caused on the lower legs. The best thing that I did in my prep for this race was to tape over the vents on the helmet. My head was relatively warm the entire bike ride. I think I drank 3 ounces of my coconut water/ water mixture. Run: Coming out on the run I heard Jeannie yell at Dan that David and Dave were up the road. I also knew this and set off to find as many people in front of me as I could. The first mile was painful as I attempted to remember that my feet left like. There was a constant lack of feeling except an annoying rub on the bottom of my left foot. Dan Bjorkstrand ran on my shoulder for a while before leaving me behind. Between mile 1 and the turnaround at the 1.6-mile mark it felt like a dark time in the run, my pace fell off and I lacked some motivation. However, I began to catch people and set my sights on the next person in front of me that was running. The road conditions were not terrible on the run until we made the turn toward the baseball fields and the school. A wet, muddy, sloppy trail is what I met as I caught and passed Matthew Dickenson. This was a good feeling as I remembered back on the bike when he passed me. It was nice to feel that the run is a benefit to my placing and not just ‘there’ to end the race. I crossed the finish line, ripped the timing chip off and caught up with David Bjorklund and Dan Bjorkstrand in the finish chute. I made my way inside, couldn’t quite think about what to do next because my mind was frozen and I was cold. Showered, cleaned up transition, and made it back to the pool just in time for the 30-39 male awards. Took home a 3rd in the age group, 9th overall, and a lot to think about before the next race. The positive was, no side stitches, no major cramps (nothing that wasn’t tolerable), and I was able to run effectively off the bike. 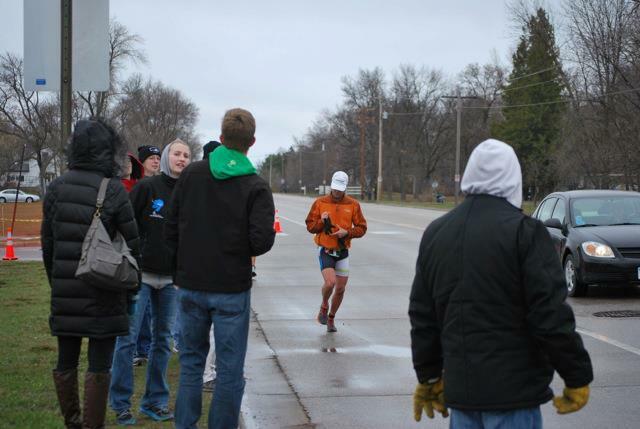 May 20, 2013 in Race Report.